Available Now (click any special to get the Merchandise Page)! Here it is: an opportunity to support The Gomers and get additional content. It’s The Two Gomers Special Episodes! 1. Head over to the Gomer Merchandise page. 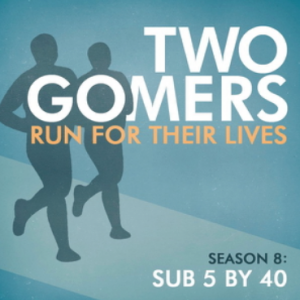 You can download and donate the latest episode for a suggested donation of $2.99 or in increments of quarter-marathon amounts. The link to the special will be sent to you in an email receipt. 3. Enjoy it for the rest of eternity. 4. Oh, and tell your friends. 5. All the back issue Specials are also available at the Merchandise Page for the low price of $5.99 TOTAL (1/2 price of suggested retail)! Oh, and you can always get any specials for free, but donations are appreciated! Bring it on guys! Can’t wait! Stephen, I’m hoping to “recognize” you in St. Pete on the street somewhere when I’m down for the race in 2 weeks. Keep up the great work guys! Don’t worry, Heidi, people confuse us all the time. You’re no more Gomerish than the rest of us! Can’t wait to guiltlessly listen to these special episodes! Thanks for providing us an opportunity to (optionally) help you out!